UCLA's legendary former basketball coach John Wooden, who in 27 years led his teams to stunning triumphs and was just as well known for mentoring his players off the court and for his motivational "Pyramid of Success," died at 6:45 p.m. of natural causes. He was 99. His 100th birthday would have been Oct. 14. Wooden had been admitted to Ronald Reagan UCLA Medical Center on May 26. Funeral services will be private. Per the wishes of the family, there will be a public memorial at a later date, with a reception for former players and coaches. 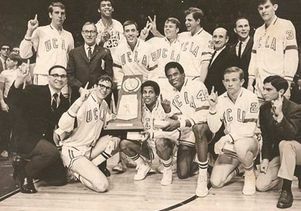 At UCLA, Wooden's teams won a remarkable seven consecutive National Collegiate Athletic Association (NCAA) championships between 1967 and 1973, and 10 titles (1964, 1965, 1967, 1968, 1969, 1970, 1971, 1972, 1973 and 1975) in his final 12 seasons as head coach. At one point in the early 1970s, the Bruins won an NCAA-record 88 games in a row, a run that included undefeated 30-0 seasons in 1971–72 and 1972–73. UCLA also won 38 consecutive NCAA Tournament games between the 1963–64 and 1973–74 seasons, another record. Wooden retired from coaching following the 1975 season with a UCLA record of 620 wins and 147 losses. Only twice during his tenure did the Bruins lose home games at Pauley Pavilion, where he coached from the 1965–66 through 1974–75 seasons. "This is a sad day at UCLA," said UCLA Chancellor Gene Block. "Coach Wooden's legacy transcends athletics; what he did was produce leaders. But his influence has reached far beyond our campus and even our community. Through his work and his life, he imparted his phenomenal understanding of leadership and his unwavering sense of integrity to so many people. His 'Pyramid of Success' hangs in my office to remind me every day of what it takes to be an effective leader. He was truly a legend in his own time, and he will be a legend for generations to come." "There will never be another John Wooden," said UCLA Director of Athletics Dan Guerrero. "While this is a huge loss for the Bruin family, Coach Wooden's influence reaches far beyond Westwood. Coach was a tremendously significant figure. This loss will be felt by individuals from all parts of society. He was not only the greatest coach in the history of any sport but he was an exceptional individual that transcended the sporting world. His enduring legacy as a role model is one we should all strive to emulate. 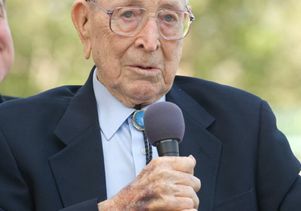 "I can still recall my first interactions with Coach Wooden when I was a member of the UCLA baseball team and he was in the midst of his incredible run of championships," Guerrero said. "While attending those basketball games was certainly a highlight for me, what stands out even more was Coach making the effort to come to our baseball games to cheer for us, and what a special feeling that was for our team. Since then, I have had the unique opportunity to develop a close personal relationship with Coach Wooden over the years. That's something I will treasure for the rest of my life." Wooden's rosters included some of the most accomplished players in the history of college basketball, most famously two centers — 7-foot-2-inch Kareem Abdul-Jabbar (Lew Alcindor during his Bruin career), who played in the late 1960s, and Bill Walton, who played for Wooden in the early 1970s. In March 2008, Abdul-Jabbar was selected as the greatest player in the history of college basketball by ESPN and Walton was ranked No. 3. Both went on to stellar professional careers. Among the other basketball greats who played for Wooden at UCLA were Willie Naulls, Walt Hazzard, Gail Goodrich, Sidney Wicks, Jamaal (Keith) Wilkes and Marques Johnson. "It's kind of hard to talk about Coach Wooden simply, because he was a complex man," Abdul-Jabbar said in an interview with UCLA. "But he taught in a very simple way. He just used sports as a means to teach us how to apply ourselves to any situation." Wooden was the first person — and remains one of only two — to be inducted into the Naismith Memorial Basketball Hall of Fame as both a player (1960) and a coach (1973). He was also a member of the inaugural classes of the National Collegiate Basketball Hall of Fame (2006), the Pac-10 Basketball Hall of Honor (2002) and the UCLA Athletics Hall of Fame (1984). In 2003, President George W. Bush presented Wooden with the Presidential Medal of Freedom, the highest honor given to a civilian. But just as important as his accolades, winning record and star teams was his approach to the game of life, which raised his coaching style to the level of a philosopher's. He was known for reciting his father's "two sets of three" — "never lie, never cheat, never steal" and "don't whine, don't complain, don't make excuses" — and a seven-point creed also passed along by his father. The point Wooden used most in his coaching, he said, was "make each day your masterpiece." Still, Wooden was probably best known for his famed "Pyramid of Success," which he began developing in the 1930s. He said that it was "the only truly original thing I have ever done." At the base of the five-level pyramid are industriousness, friendship, loyalty, cooperation and enthusiasm. The next levels up are self-control, alertness, initiative and intentness; condition, skill and team spirit; and poise and confidence. At the pinnacle is competitive greatness, which he defined as performing at one's best ability when one's best is required, which, he said, was "each day." Wooden also promoted his "12 Lessons in Leadership," including Lesson 11: Don't look at the scoreboard. But while Wooden was high-minded in his approach to coaching, he also was practical. He famously began each season with a coaching session on dressing properly that included showing his players how to put on their shoes and socks the right way. "This is a game played on your feet," he said. "If you get blisters, you can't play the game." Abdul-Jabbar said Wooden didn't expect more from his players than he did from himself — but then again, that was quite a lot. "He set quite an example," Abdul-Jabbar said. "He was more like a parent than a coach. He really was a very selfless and giving human being, but he was a disciplinarian. We learned all about those aspects of life that most kids want to skip over. He wouldn't let us do that." 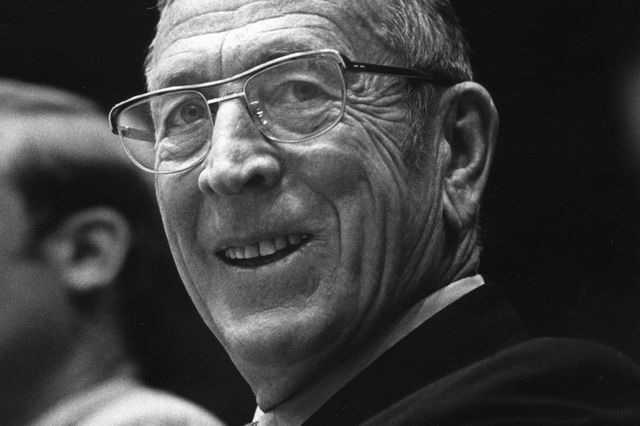 John Robert Wooden was born Oct. 14, 1910, in Hall, Ind., one of four sons of a farmer and a housewife. Wooden said he learned from his father true leadership — when to be firm, when to be flexible, when to have the strength to be gentle and when to have the strength to force compliance. His mother made Wooden and his brothers their first basketball by tying together old rags and black cotton stockings. Wooden grew up in Hall and the nearby Indiana towns of Centerton and Martinsville. He began playing basketball at Martinsville High School, where they called him "Indiana Rubber Man" because every time he went down on the court, he bounced right back up. At Martinsville, he won All-State prep honors in basketball for three consecutive years, leading his team to the Indiana state title in 1927 and runner-up titles in 1926 and 1928. Losing the 1928 title game, he said decades later, "was the most disappointing thing that ever happened to me as a player." 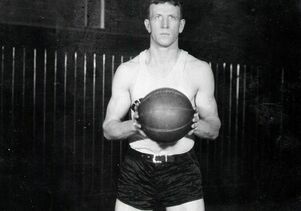 At Indiana's Purdue University, Wooden won letters in basketball and baseball during his freshman year and later earned All-American honors as a guard on the basketball team, from 1930 to 1932. He was captain of Purdue's 1931 and 1932 basketball teams and led the Boilermakers to two Big Ten Conference titles and the 1932 national championship. He was named college basketball's 1932 Player of the Year, received the 1932 Big Ten Conference medal for outstanding merit and proficiency in scholarship and athletics, and was inscribed on Purdue's academic honor roll. Shortly after graduating from Purdue in 1932, Wooden married Nell Riley, whom he had met at a carnival when he was 15. They remained together until her death in 1985. He considered his wife his "lucky Nell" — he never began a game without finding her in the stands and getting a wink and an OK signal from her. Wooden began his coaching and teaching careers at Dayton High School in Dayton, Ky. There, he coached numerous sports teams, including the basketball team, which he coached to the only losing season in his entire career as either a player or coach. During World War II, he served as a lieutenant in the U.S. Navy and spent time aboard the USS Franklin in the South Pacific. Following his discharge in 1946, he coached at Indiana Teachers College (now Indiana State University) for two seasons before coming to UCLA. 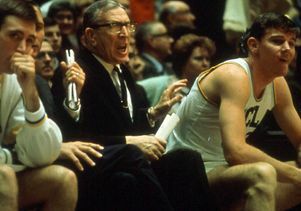 Wooden said that his most gratifying UCLA season was his last, 1974–75, when the Bruins won a national championship despite having only one returning starter, David Meyers. Four players from the previous year had been drafted by professional teams, including Walton and Wilkes. But even before the 1975 NCAA Championship game, Wooden had made his decision to leave coaching. After the national semifinal game, a stunning 75-74 double-overtime victory against the University of Louisville, Wooden said he found himself not wanting to talk to the media. He said he had never felt that way before and knew it was time to get out. He went to the locker room, gathered his players around him and announced his decision. Wooden later recounted to UCLA Magazine that he told his players, "I don't know how we'll do Monday night against Kentucky, but I think we'll do all right. Regardless of the outcome of the game, I never had a team give me more pleasure. I'm very proud of you. This will be the last team I'll ever coach." The Bruins went on to defeat the University of Kentucky 92-85 in the finals, winning their 10th NCAA title in 12 years. 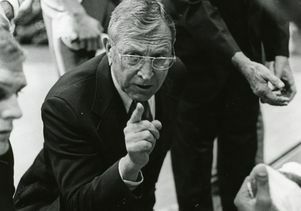 After he left coaching, Wooden kept busy with basketball clinics, personal appearances and interviews, and wrote or co-wrote many books, including "The Essential Wooden," "Coach Wooden One-on-One," "Coach Wooden's Pyramid of Success," "Wooden on Leadership" and "Inch and Miles: The Journey to Success," a children's book. Wooden was often called the "Wizard of Westwood," a moniker that he did not like. 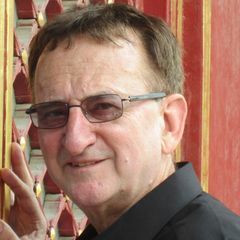 "I'm no wizard, and I don't like being thought of in that light at all," he told Marina Dundjerski, director of the UCLA History Project, in an interview in 2006. "I think of a wizard as being some sort of magician or something, doing something on the sly or something, and I don't want to be thought of in that way." He said he preferred being called simply "coach." "Coach is fine," Wooden said. Wooden is survived by a son, James, of Orange County, Calif.; a daughter, Nancy Wooden, who lives in Los Angeles' San Fernando Valley; three grandsons and four granddaughters; and 13 great-grandchildren. Wooden often said that with the passing of his wife, Nell, he lost his fear of death. "I look forward to seeing her again," he told UCLA Magazine in 2007. On Dec. 20, 2003, the basketball floor in Pauley Pavilion was dedicated as the Nell and John Wooden Court. Famed UCLA coach John Wooden. John Wooden coaching his players at UCLA. Coach John Wooden yelling on the bench at a UCLA basketball game. Coach John Wooden with UCLA national championship team that included Kareem Abdul-Jabbar, known then as Lew Alcindor. 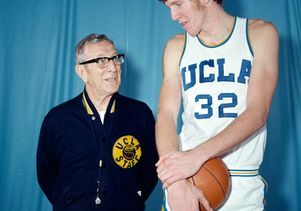 UCLA coach John Wooden with Bill Walton. 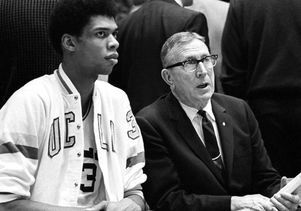 Coach John Wooden with star player Kareem Abdul-Jabbar, who played for UCLA as Lew Alcindor.